Signed and dated bottom right: Ph. Mercier fecit/1733. While it is reasonable to suppose that on apparent age the Prince's three elder sisters are represented,  and indeed they are so named (but not identified) in the Shotover sale, 1855 (see Provenance), there is no firm evidence for saying which sitter is which. The grounds for identifying the Windsor drawing as Anne are not apparent; there is no contemporary inscription. Anne seems to have been identified on the strength of Egmont's comment on her prowess on the harpsichord. Worlidge's drawing, for what it is worth, shows a different activity - sketching. It would be relevant to ascertain, if possible, the musical accomplishments of the other sisters, and the significance of the volume of Milton. In the absence of such information, it seems a little fanciful to attribute particular accomplishments exclusively to specific individuals. The present identifications seem to date only from Edwards' article. Drawing and the harpsichord were common eighteenth-century accomplishments. In the absence of evidence to the contrary, it is at least arguable, as suggested by John Ingamells, that in view of the well-known antipathy between the Prince and the Princess Royal at this date, Anne may be the figure, previously called Amelia, who holds the book, somewhat apart from the others, her hand almost covering her ear. Frederick learned to play the bass-viol in 1732-33,  but another source has the cello  (here clearly depicted), he must have advanced sufficiently to cope with an independent part in chamber music. He is not playing a solo but is perhaps amplifying the bass of the harpsichord with figuring. 'Concerto' in reference to this group is not to be confused with modern usage. At this date it implies simply a work for several instruments, and is best rendered by the term 'chamber music'. Egmont reports both Frederick's enthusiasm for the bass-viol and Anne's competence at the harpsichord. 1) Sir Oliver Millar, The Tudor Stuart and Early Georgian Pictures in the collection of Her Majesty The Queen, 1963, p 175. The Royal collection version has in the past been ascribed, on occasion, to J. F. Nollekens. 2) Bequeathed by Lord Astor to the National Trust, 1942; previously lot 9 from the sale of W. E. Biscoe of Holton Park, Oxford, Christie's, 20 June 1896: 'P. Mercier. 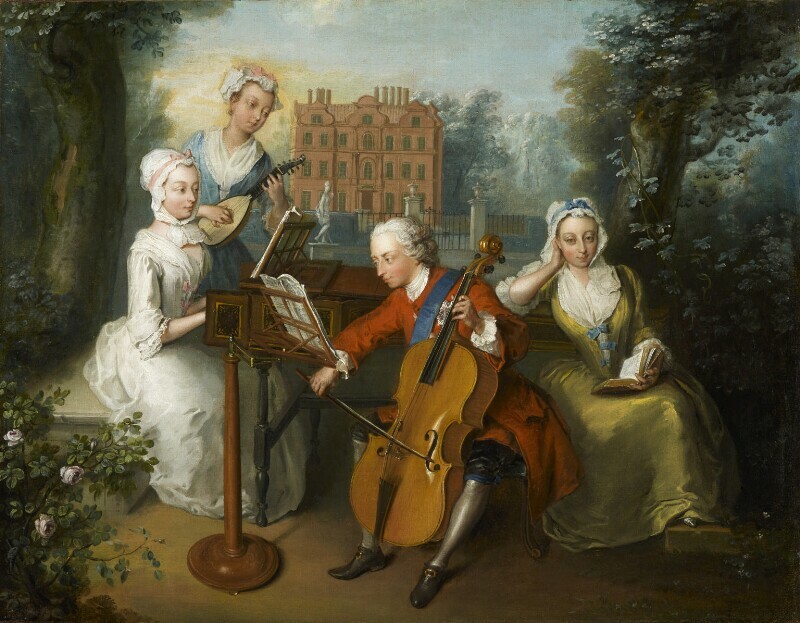 View of Cliveden with Frederick Prince of Wales, playing the cello, accompanied by three ladies. 30 ½ x 22 ½ ins.' The lot was bought by Davis for £245. The house is not Cliveden, but the Dutch House, Kew, as in NPG 1556; reproduced in colour, W. J. Turner, English Music, 1942, p 32. I am most grateful to Mr Oliver Millar for reporting this picture, and to Mr John Ingamells for discussing with me his draft entries for the three versions in the exhibition 'Philip Mercier', Kenwood. 3) A. P. Oppé, English Drawings ... at Windsor Castle, 1950 (694-95). 4) British Museum 1905-4-14-43; reproduced Edwards, fig.4; it was once in the collection of the cellist and composer Nicolo Haym, d. 1729, according to J. Ingamells, ‘A Hanoverian Party on a Terrace by Philip Mercier', Burlington Magazine, CXVII, 1976, and the same group was also used in the title-page of the British Miscellany, 1732. 5) The other two sisters, Mary, b. 1723 and Louisa, b. 1724, are too young to be represented. 6) Diary of Viscount Percival afterwards Earl of Egmont (Historical Manuscripts Commission 63), 1920-23, p 454. 7) Frederick quarrelled with his sister over her marriage and she may have abandoned the picture. 8) The Schütz family owned a Mercier of 1725, see R. Edwards, 'Mercier's Music Party', Burlington Magazine, XC, 1948, p 311, note 10. This was with Leger galleries, 1975. 9) Diary of Viscount Percival afterwards Earl of Egmont (Historical Manuscripts Commission 63), 1920-23, I, p 290. 10) Sir Oliver Millar, The Tudor Stuart and Early Georgian Pictures in the collection of Her Majesty The Queen, 1963 (522), suggesting that the sisters are accompanying the Prince. Diary of Viscount Percival afterwards Earl of Egmont (Historical Manuscripts Commission 63), 1920-23. R. Edwards, 'Mercier's Music Party', Burlington Magazine, XC, 1948. J. Ingamells, ‘A Hanoverian Party on a Terrace by Philip Mercier', Burlington Magazine, CXVII, 1976. From left to right: Anne, Princess Royal (? ), 1709-59 (married 1734, William, Prince of Orange), playing harpsichord; Princess Caroline (? ), 1713-57, plucking the mandora (a form of lute); Frederick, Prince of Wales, 1707-51, wearing ribbon and star of the Garter, playing violincello; Princess Amelia (? ), 1711-86, a volume of Milton open in her lap; in the background, the Dutch House at Kew; roses in bloom on the left. Some retouchings, but difficult to assess as the varnish is very discoloured; perhaps once a picture of about 30 x 22 in., and cut down. 1) R. Edwards, 'Mercier's Music Party', Burlington Magazine, XC, 1948, p 311; see also the letter from Ralph Edwards in the NPG archives. 2) J. Ingamells, ‘A Hanoverian Party on a Terrace by Philip Mercier', Burlington Magazine, CXVII, 1976, p 512, note 7. All three versions, 'Philip Mercier', Kenwood, 1969 (24-26).